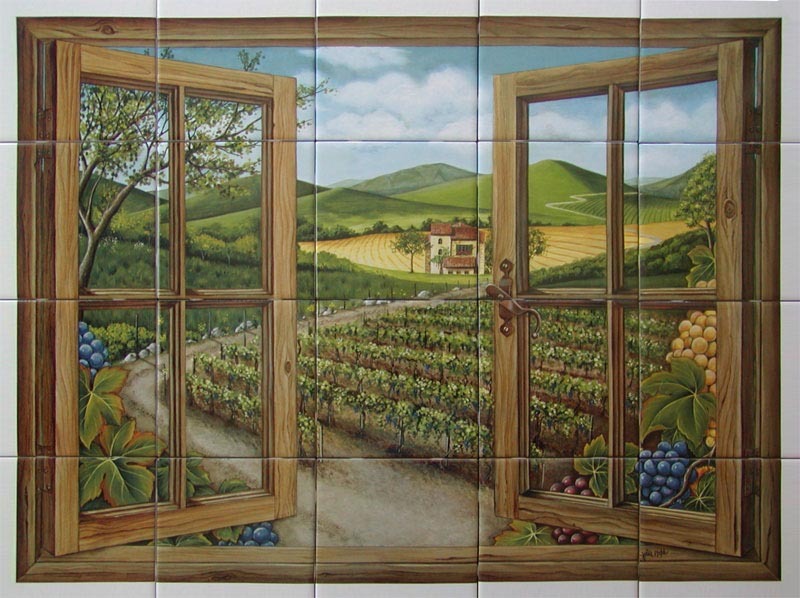 "Tuscan Window" is a beautifully detailed ceramic tile mural depicting the Italian Tuscany countryside, perhaps through an open window of an old winery. There are grapes and vines in the foreground framing the window. In the distance is a Tuscan Villa set in cultivated fields with a road winding into the hills. Coordinated accent tiles which depict grapes, other kinds of fruit, grape leaves and vines are available. Available on white glossy, white matte or simulated travertine. Size of Artwork: 29" x 22" On 6"x 6" tile: 30" x 24"
Accents available on 6"x 6". If diagonal grout line orientation is required, please specify in "Contact us"